Supply nutrients. When fresh manure is spread on a field, about 50 percent of the nitrogen is in a highly soluble form and will be washed out by rain when it is spread on a pasture. In compost, however, 95 to 97 percent of nitrogen has been converted to a much more stable form and will be slowly released, allowing plants to use it over a longer period of time. Compost doles out nutrients slowly when plants are small and at greater rates as soil temperatures warm up and the major growth period begins. (Soil microorganisms that release the nutrients from compost work harder as temperatures increase.) The benefits of adding compost will also last for more than one season. Composted manure releases about 50 percent of its nutrients in the first season and a decreasing percentage in the following years. This means that with constant additions of compost. The reserves of plant nutrients in the soil are being built up to the point where, for several seasons, little fertilizer of any kind may be needed. Bacteria, earthworms, and pH. Compost also supports essential soil bacteria; feeds earthworms and allows them to multiply; and gradually changes soil pH levels that are either too low (acidic) or too high (alkaline). Using compost in garden and landscape areas. Compost can be worked into garden beds by hand or with a tiller or added to the soil when planting trees, shrubs, annuals, or perennials. 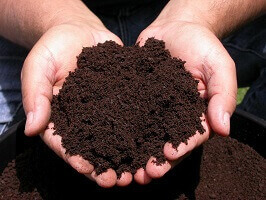 Compost is also an excellent mulch or topdressing around flowers, shrubs, and trees. This mulch will help your plants get through the dry summer with less need for irrigation. When using it as a mulch around trees or shrubs, start three to four inches from the trunk and spread the compost out to the dripline keeping it about three inches deep.